Home/News/The Underrated Benefits Of Ice Cubes! The Underrated Benefits Of Ice Cubes! The skincare market is literally exploding with new products every single day and there are so many options for every kind of ailment or need. There are expensive creams and skincare products made with all sorts of exotic ingredients that boast to be the best for your skin and to give you all kinds of benefits. But it seems that one beauty secret that many celebrities and beauty gurus have in common is something that is neither expensive or out of the ordinary. That one ingredient is ice and beauty gurus and celebrities have been using it for many years to not only improve the quality of their skin but to also take care of many common skin ailments. Not only can you use ice just as it is, as simple frozen water, but you can also boost its abilities with cucumber, aloe, green tea, and milk infusions. The ice can also be used in a many different ways as well. Ice massages are definitely a thing and ice cubes can also be used to ‘sculpt’ the face, as spot treatments, even as a face mask or by submerging your whole face in an ice bath for a few seconds at a time. What exactly ice can be used for is quite a variety of things. Kate Moss swears by a face ice bath as a way to combat morning puffiness and you can use ice cubes at home to lessen the effects of an unexpected pimple. 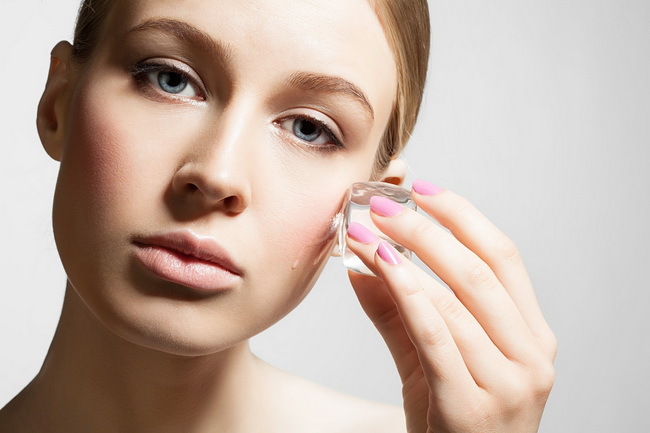 Below are all the ways you can utilize the humble ice cube and find yourself surprisingly in love with one of the simplest skincare products available. One of the best uses for an ice cube is for the reducing of red and inflamed pimples. The ice can even help with pain in the same way it helps to relieve pain in bruises. Ice cubes can help with almost any kind of inflammation, no matter what it is associated with. Rosacea and allergic reactions can be calmed with ice cubes. To use ice cubes for pimples, you simply have to wrap one in a paper towel or think cotton cloth and hold to the area for a minute at a time until the redness retreats. Alternatively, you can also massage an entire area with an ice cube and you can create ice cubes with certain ingredients such as aloe or cucumber to pack in even more benefits. Just as the coldness of an ice cube can reduce inflammation, the same ice cube can boost circulation and remedy skin that has lost its ‘glow.’ The extra flow of blood will bring color and a new boost to your face that will serve as a great morning pick-me up. To use, simply run an ice cube from your chin up your jawline to your earlobe and then across your cheek to your nose. Then go up the side of your nose to your forehead and across, back towards your ear, right above your eyebrows. Repeat on the opposite side of the face.